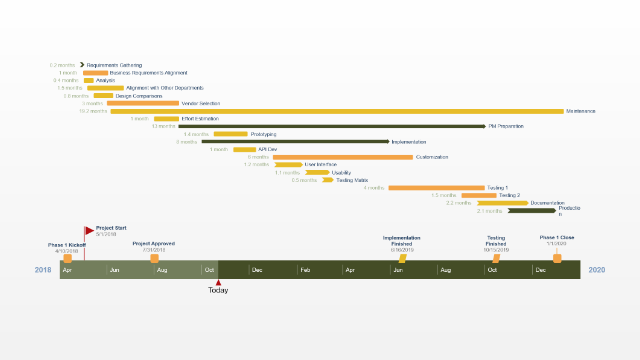 The free project outline template is a downloadable PowerPoint Gantt chart slide designed for professionals who need to create project plans for teams, clients and executives. The template lays out the general phases, steps and milestones of a standard project, providing a good starting point for managers and team leaders in planning and sketching their project’s direction. Important milestones or deliverables required in each phase. The tasks needed to create the deliverables. These can be further broken down into sub-tasks or grouped by phases or teams. 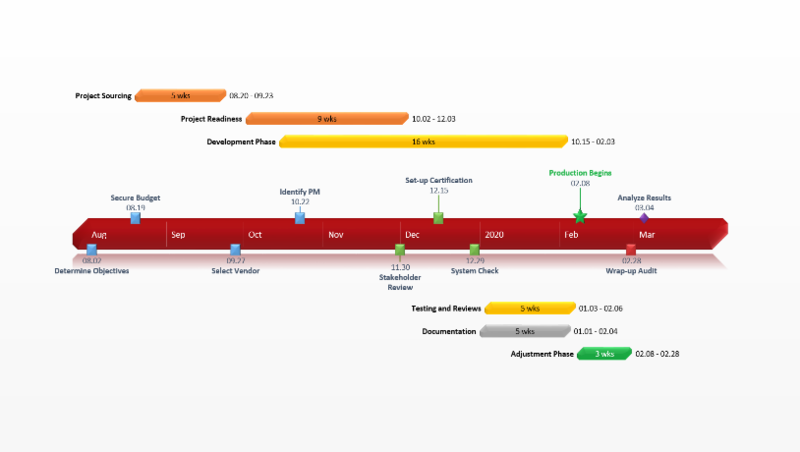 Rough timeframes for each project phase, task and milestone. Potential risks that may jeopardize certain tasks or milestones. To keep the visual clean and simple, planners can use colors to show which activities may require particular attention. Once ready, the visual outline can be useful not only in the planning process. 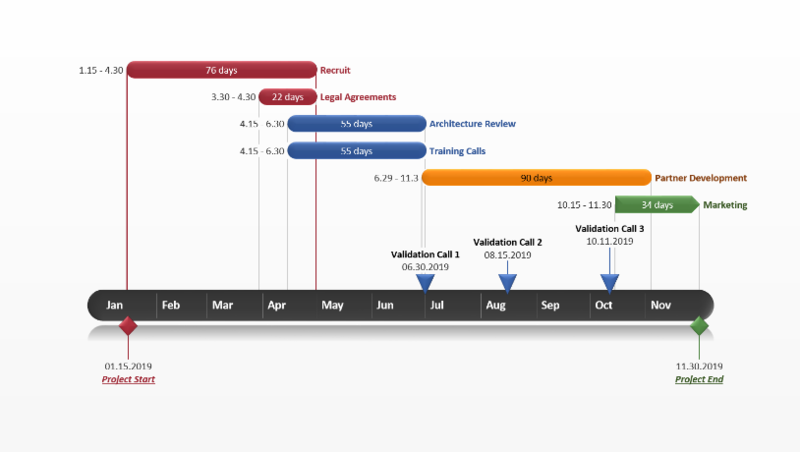 Updated regularly, it can be repurposed for progress reviews and executive reports all throughout the project’s life cycle, allowing project managers to present an eye-catching, easy-to-grasp overview of the project to clients and executives. This will help keep agreement with important decision-makers and ensure all stakeholders involved have a common base of communication. 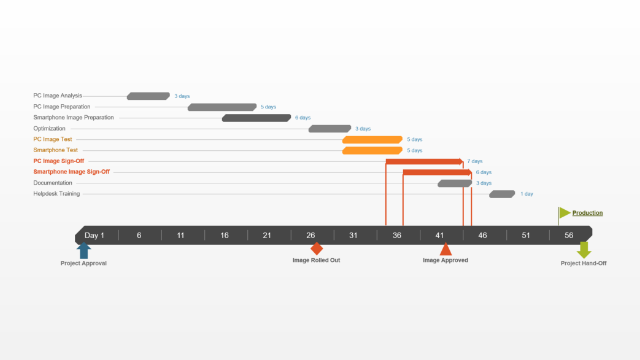 To update, restyle or repurpose the project outline template, professionals can quickly edit it right inside PowerPoint. There are two ways they can do it: either by using PowerPoint’s customization features, or by installing a lightweight add-in from Office Timeline to make the process faster and easier. 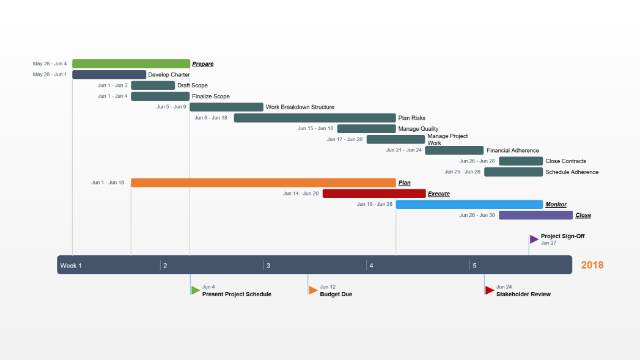 Office Timeline is a user-friendly Gantt chart maker that helps professionals build and update high-level project visuals automatically. With the Plus Edition of the add-in installed, professionals can quickly paste or import their data right into the outline template, update it whenever plans change, or add indicators such as Percent Complete or Task Duration. This will ensure they always have an accurate overview of the project that can be ready for important presentations as fast as needed.